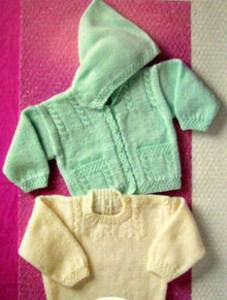 Hooded cardigan and sweater: 41cm 100g, 46-51cm 200g, 56-66 300g. Based on 100g balls baby DK. Tension 22sts/ 28rows to 10cm on 4mm needles. Suggested yarns any baby DK. 3.25 and 4mm needles, cable needle.